LG Electronics just took the lid off its newest phone ahead of its Mobile World Congress launch. The LG Optimus 4X HD features a 1.5GHz quad-core Tegra 3 processor, a 4.7-inch True HD IPS display and Ice Cream Sandwich. The phone will be launched at the MWC 2012 in Barcelona, ​​Spain. 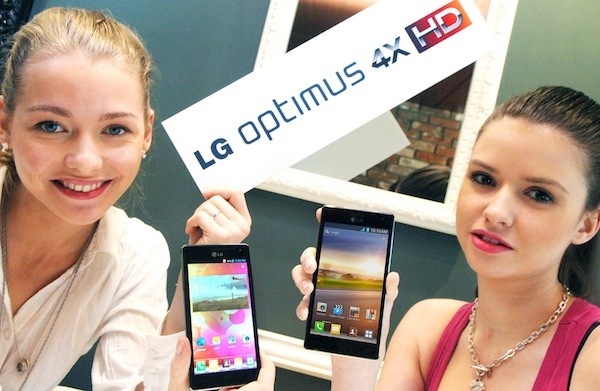 LG was the first to launch a dual-core phone with the Optimus 2X and now it’s also the first to unveil a quad-core phone with the Optimus 4X HD. The phone’s NVidia Tegra 3 CPU features 4 cores as well as a low-power drive companion core. The four cores will handle heavy tasks such as playing games, playing HD video and multi-tasking while the companion core will handle the simpler tasks such as calls, emails and music playback. This makes sense since a quad-core CPU would easily drain the phone’s battery if it were to function full time. The 4.7-inch high resolution ‘True HD IPS’ display on the Optimus 4X HD is a great feature. An IPS display is known for better viewing angles compared to non-IPS types. The phone will come in at 8.9mm thick, pretty slim by current phone standards. The Optimus 4X HD will also feature MHL (Mobile High Definition Link) and DLNA (Digital Living Network Alliance). The photo featured above shows LG’s version of Android 4.0 Ice Cream Sandwich. I don’t see the virtual button, which is one the things I love about the stock ICS on the Galaxy Nexus. I guess LG decided to put the controls below the screen, just like the current controls on Android 2.3 Gingerbread. I’ll update the post as soon as I get details on pricing and release date. Quad-core smartphones are the next big thing and I can’t wait to get one of my own. I read somewhere that they enhanced the battery on this phone to better handle all that power which is a huge plus. I watch videos quite a bit throughout the day so definitely need some extra battery power. I get HD programming at home through my employer, DISH, and love how crisp and clear the picture is. With this phone’s 4.7 inch True HD IPS screen, I’ll finally be able to get the same high-quality image as I get at home, on the go. Hintayin ko nalang ung pantapat ng samsung.